If you have an TIWImageFile control (for instance) and its ImageFile.FileName property points to /Files/SomeImage.png, you must have the SomeImage.png file under wwwroot/Files/ directory. All relative paths are based on wwwroot content path folder. IWImageFile1.ImageFile.FileName := 'SomeImage.png'; // no path is required in this case! IntraWeb server WON'T ever serve a file outside its ContentPath (wwwroot) folder, unless you use WebApplication.SendFile() or SendStream() methods. You may also set a different ContentPath folder for your IntraWeb application. This should be done in ServerController.OnConfig event handler. When you are working with templates, they should be located inside the Templates folder, located below your application main executable. Please check the picture above. TURLResponder components were discontinued. They have been replaced by the new TContentHandler (and descendant) classes. Please note that these are not TComponent descendants, so they are not visible from the Delphi's component pallete. They are lightweight classes and consume less system resources. The most used content handler classes are: TContentForm and TContentRedirect. The new TIWFile control does not work in latest IntraWeb versions anymore. It was replaced by the new TIWFileUploader, a new and modern AJAX control. The new IWFileUploader gives developers much more control of the upload process (e.g. file extensions and file sizes) and a better upload experience for the user, because it does not require a full submit. Please note that IWFile is still present on the component palette, and the associated dcu/pas file are still there, but it does nothing. We let the control there so you can safelly open your IW XI or XII application form and replace it with the new control. All ServerController setup/initialization (i.e. setting ServerController properties at runtime) must be done inside the ServerController.OnConfig event. Everything inside this OnConfig event is guaranteed to run only once during application initialization, before any request is served by IntraWeb application. Up to IntraWeb XII you could use ServerController.OnNewSession to dynamically set your application main form (e.g. based on certain conditions or run time parameters). The OnNewSession event signature changed, and you should not set the main form there. Instead, use the new ServerController.OnGetMainForm event. Please note that you MUST create the form class, and pass it to vMainForm event parameter. Not doing so will result in a runtime exception when the first application session starts, unless you are calling IWForm's SetAsMainForm() method during initialization. This is because ServerController.OnNewSession signature has changed. To fix that, just cut (Ctrl-X) the code within this event, save the unit, re-create the same event with the new signature and paste the old code there. Move any vMainForm related code to OnGetMainForm event handler. 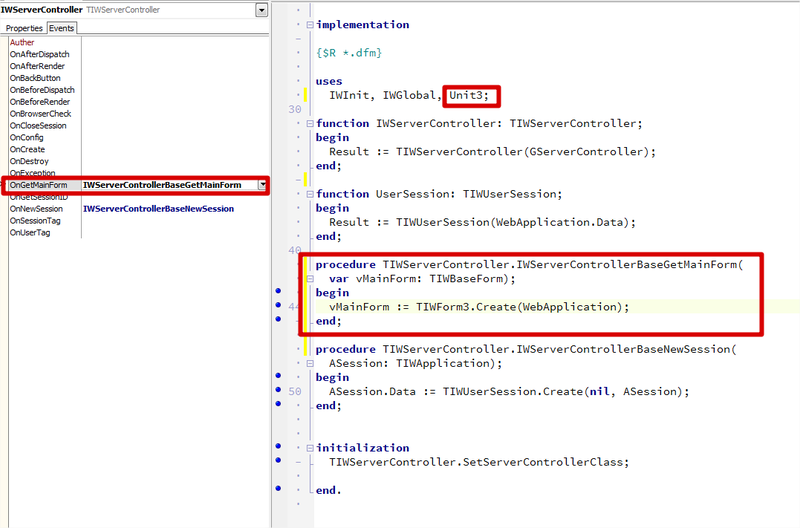 Also note that you may add ASession parameter to the TIWUserSession.Create call (this is optional, but allows you to use UserSession.WebApplication property to access the WebApplication object). In example (a) we are using an absolute path for an ISAPI application running under "mydomain.com" and having "MyLib.js" inside "wwwroot/JS/" subfolder. Absolute paths also include the protocol used (HTTP or HTTPS). In the example (b), we are using a relative path. But here, inside the "relative paths category" we also have two types of paths: document-relative and site root-relative paths. The first type of relative path (c) is usefull when the relative physical path of the current document and the linked document remain the same even when you move files around your web server. When you reference something like JS/MyLib.js you are asking IntraWeb to serve you the file named "MyLib.js" under a folder named "JS", below your current document folder. The second type of relative path (d) tells IW to serve you a file named "MyLib.js" under a folder named "JS", below the root directory. Remember that IntraWeb is a web application, not a bunch of HTML files served by some web server. When using document-relative paths like in (c), which is the current document folder? When using root-relative paths, we can be sure that some reference like (d) is pointing to a file named "MyLib.js" under a folder named "JS" below our wwwroot (or ContentPath) folder. All files referenced using root-relative paths (and also absolute paths) are served without session validation, unless the MIME type of the file is not registered in IntraWeb server. So, if you are reading only this line of this document: ALWAYS PUT A SLASH in front of your file name references and you should be safe! Please also check this good document about absolute and relative paths. 1) The cache file belongs to the IntraWeb application! This means: Once you add (or create) a cache file, it does not belong to you anymore, so don't touch it again. In older IW versions, a cache file was a regular file (e.g a PNG image file) saved under some special folder. Current cache files are more than this. The cache file contains the original data (e.g. the PNG image) but also some metadata used by IntraWeb core when serving the file. So, once the file is added to the cache, if you write something to it again, it will become useless and it won't be served correctly by IntraWeb. There is a new utility class named TIWAppCache to help you with creation of cache files. There are also many demos in our CodePlex repository showing how to work with the new cache system. The default DOC TYPE of IntraWeb's generated HTML is <!DOCTYPE HTML>, meaning that we are now using Strict or standard mode (HTML 5) by default and not Quirks mode anymore. If you need IntraWeb to render your form using a different doc type, you must set ServerController.DocType or IWForm.DocType properties (Form property has precedence over ServerController's). Browsers tend to render and behave differently when using strict mode, compared to quirks mode. In some cases, a little ajustment in visual control's size and/or position maybe required, but most forms - if not all - should render correctly. You should also add the same doc type to your template files, when using templates.